This study describes the haematological profile of the African Straw-coloured Fruit Bat experimentally infected with the rabies virus (RABV). 40 African Straw Coloured Fruit bats (Eidolon Helvum) were used for this study. The bats were grouped into A, B, C, D, E, F, G and H. Groups B to H were injected intermuscularly with rabies virus, while A served as control. On day 1, 3, 5, 7, 14, 21 and 28 post-innoculation, blood was obtained through cardiac puncture. Cell counts were performed with an automated haematological analyzer. Haematological parameters investigated were packed cell volume (PCV), erythrocyte counts, leukocyte counts, blood hemoglobin (Hb). Results showed significant increases in Hb count, MCH, MCHC, WBC and neutrophil counts when compared to the control. Significant decreases were observed in lymphocyte count, and no significant changes were observed in eosinopihils, basophils and PCV. scarce. Studies have reported presence of rabies antibodies in fruit bats in Nigeria, which suggests a possible role of the fruit bat in the maintenance of rabies in Nigeria (Aghomo et al.,1990). virus in order to establish reference values for this species. Capture and experimental infection 40 African Straw coloured fruit bats were captured from roosts in Samaru, Kaduna State, Nigeria. The animals were identified in the department of Biological sciences, Ahmadu Bello University, Zaria, Kaduna, Nigeria. The animals were kept in quarantine for 4 – 6 weeks. Oral swabs for rabies virus were negative. The animals were anaesthetized with 0.l ml/10g body weight of ketamine and inoculated 105 median mouse intracerebral lethal dose (MICLD50) (de Almeida et al., 2014) with 0.02ml of the 10% suspension of the rabies virus intermusculary into both left and right masseter muscles (Turmelle et al., 2010). The animals were grouped into A, B, C, D, E, F, G and H with group A serving as control (table 1). Results were expressed as mean ± SEM. One way analysis of variance (ANOVA) was used to compare the mean values between the groups. Statistical analyses were done using Statistical package for social sciences (SPSS, 21 Chicago Illinois). A p value of p<0.05 was considered statistically significant. 30.36±1.80) when compared to the control. MCV increased significantly in group 7 (62.88± 4.25) and decreased in groups 2, 3 and 4 (51.72±11.58, 39.52±11.18, 46.90±0.31 and 46.25±0.21) (table 2). WBC counts were significantly increased between the control (7.98±0.30) and groups 1-4 (11.88±1.69, 20.72±0.33, 14.42±1.38 and 11.90±0.31). Lymphocyte counts significantly decreased across all the groups when compared with the control (77.30±1.43). The greatest difference was observed between control and group 1 (19.54±0.65). Neutrophil count increased significantly across all the groups when compared to the control (21.40±1.15). The greatest difference was between control and group 1 (78.74±0.50). There were no significant changes observed in eosinophil and basophil counts (table 3). a indicates increase between control and group 7, b indicates decrease between control and groups 2,3 and 4. Bats are reservoirs of several high-impact viruses that cause significant human diseases, including Nipah virus, Marburg virus and rabies virus. They also harbour many other viruses that are thought to have caused disease in humans after spillover into intermediate hosts, including SARS and MERS coronaviruses. As is usual with reservoir hosts, these viruses apparently cause little or no pathology in bats. Despite the importance of bats as reservoir hosts of zoonotic and potentially zoonotic agents, virtually nothing is known about the host/virus relationships (Schountz, 2014). Experimental infection with RABV did not produce any significant change in RBC counts and in PCV. 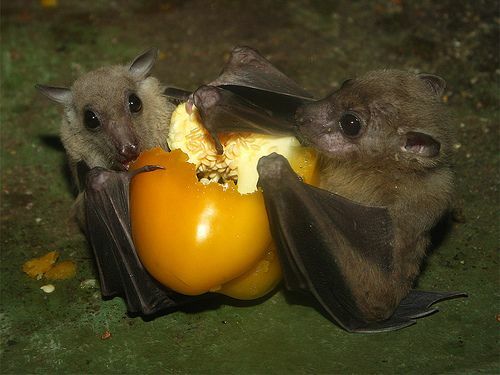 The values obtained for both RBC count and PCV were within the normal range for the African Straw Coloured fruit bat as reported by Balthazary et al., (2007). The haemoglobin concentrations showed significant increases however the figures obtained were all within the normal range for the species (11.3±2.6 g/dl). The mean values for mean corpuscular volume (MCV) also displayed significant increases although the values were also within the normal range for the African Straw Coloured Fruit Bat (59.6±18.3 mm 3). Mean corpuscular haemoglobin (MCH) and mean corpuscular haemoglobin concentration (MCHC) also displayed significant increases that were within the normal range (15.5 ± 6.4 pg and 26.3 ± 7.3 g/dl respectively) as reported by Balthazary et al., 2007). These results indicate that the RABV infection did not alter the values of these parameters beyond the normal values. White blood cell count increased significantly across the groups. These values far exceed the reported normal ranges of WBC counts in as reported by Balthazary et al., 2007 and Torrance, 2009. The white blood cells are the cells of the immune system and involved in protecting the body against infection and foreign invaders (Maton et al., 1997). The increase in the values indicated an immune response was mounted by the immune system of the bats in response to the RABV infection. De Almeida et al., 2014, reported lower WBC values after experimental infection with RABV in hematophagus Desmondus Rotundus bats. However, Gnanadurai et al., (2013) found that experimental infection of dogs with a wt RABV is not invariably lethal, and that survival correlates with the presence of high VNA titers, evidence of WBC infiltration, and elevated levels of protein in the CSF. There were significant increases in neutrophil count and decreases in lymphocyte count. This disagrees with the work of de Almeida et al., 2014, who reported increases in lymphocytes and decreases with neutrophils in hematophagus Desmondus Rotondus Bats. However, neutrophils are the first line of defence in viral infections and their numbers generally increase within the first hours of viral infection. The cellular innate immune response to microbes consists of two main types of reactions: inflammation and antiviral defense. Inflammation is the process of recruitment of leukocytes and plasma proteins from the blood, their accumulation in tissues, and their activation to destroy the microbes. The major leukocytes that are recruited in inflammation are the phagocytes, neutrophils (which have short life spans in tissues) and monocytes (Abbas et al., 2015). Experimental infection of the African Straw Coloured Fruit Bat (Eidolon helvum) with rabies virus resulted in increased WBC infiltration with increases in neutrophil counts in the early stages of infection. These findings differ from other bat species studied by previous researchers. The RBC counts correspond with previously documented results. Studies on infections in the African Straw Coloured Fruit Bat (Eidolon helvum) are scarce and more work needs to be undertaken to establish the pattern of immune response of this specie. The authors thank the Ahmadu Bello University, Zaria, Kaduna State, Nigeria for supporting this project. The authors would also like to thank the staff of the Veterinary Teaching Hospital, Ahmadu Bello University, Zaria, Kaduna State, Nigeria for assisting in this project. Calisher CH, Childs JE, Field HE, Holmes KV, Schountz T. (2006) Bats: important reservoir hosts of emerging viruses. Clinical Microbiology Reviews 19:531e45. Danmaigoro A., Onu JE, Sonfada ML, Umar AA, O y e l o w o F O , a n d H e n a S A ( 2 0 1 3 ) ,“Histomorphometry of the lower respiratory system of Straw Coloured Fruit Bat (Eidolon helvum),” Scientific Journal of Health, Safety and Environment, vol. 1, no. 4, pp. 75–80. Mazarakis ND., Azzouz M.and Rohell JB. (2001) Rabies virus glycoprotein pseudotyping of lentiviral vectors enables retrograde axonal transport and access to the nervous system after peripheral delivery. Mol. Genet., 10, 2109-21. Messenger SL., Smits JS. and Rupprecht CE. (2002). Emerging Epidemiology of Bat-associated cryptic cases of rabies in humans in the United States. Infect. Dis., 2002, 35, 738-47. Riede K, “Global register of migratory species: from global region,” Final Report of R and D Projekt 808 05 081, Federal Agency of Nature Conservation, 2004. Samuel, C. E. (2001). Antiviral actions of interferons. Microbiol. Rev.14:778–809.